We do not speak of 'minicomputers' today, but if we did, what would come to mind is not an EIA 19" equipment rack packed full of equipment. Only network servers with teraflops of computing power and/or petabytes of data storage are configured thus these days. 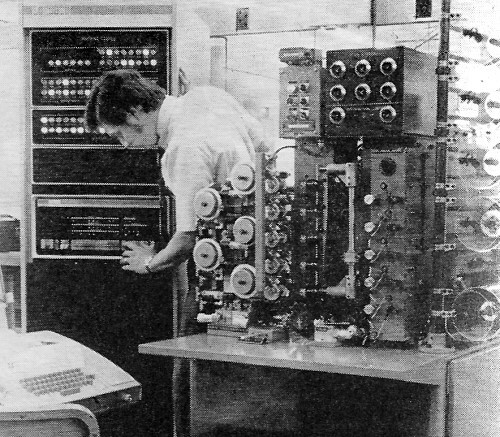 'Minis' in 1972 sported microprocessors that handled 8- or 16-bit words and a whopping 32 kBytes of operating system and program execution memory. FORTRAN, ALGOL, and BASIC were the languages of choice - with no object-oriented code in sight. Don't laugh at the poor slobs of computer yesteryear or congratulate yourself for living in an enlightened and highly facilitated time. 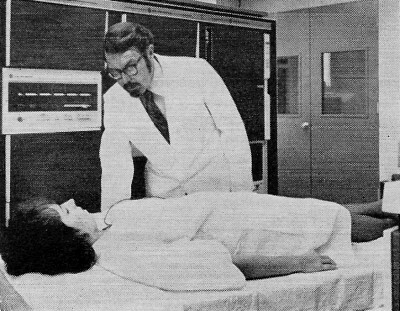 45 years from now - heck, 20 years from now - our kids will look back at 2017 and chuckle at the thought of silicon technology with rigid binary logic compared to their bioelectronic circuits and quantum computing. Unlike the the perpetual promise of fusion electricity generators (tokomaks) and a flying car in every garage, the aforementioned will definitely arrive on schedule - guaranteed or your subscription fee to RF Cafe will be fully refunded. Digital Equipment Corp. minicomputer with host of input/output blocks uses airport runway data measured photo-electrically to obtain visual range. Anyone who is familiar with the meaning of such mod terms as "miniskirt" and "minibike" can conjure up at least a vague notion of what is meant by the term "minicomputer." In simple terms, a minicomputer is a small computer - at least as far as size is concerned. The sale prices of minicomputers are not very small, but neither is the present rate of sales. Even with price tags for the breadbox-size computers ranging from $6000 to $25,000, more than 10,000 of them have found their ways into new kinds of electronic instrumentation since 1968. More than half of these were sold during 1970, and the rate of sales will most likely double again in 1972. There must be something revolutionary about minicomputers which cost more than a new Cadillac but still sell faster than candy bars at the movies. They must offer the buyer something unique and useful. Any little instrument that can keep more than 70 computer manufacturers - many of them flourishing new companies - turning out minicomputers at full capacity is bound to have a powerful impact on modern business, industry, and technology. Minicomputers are basically stripped-down versions of the large general-purpose machines. In fact, many of the well established computer firms make their minis from a small selection of the most important circuit boards and components used in their large computer products. Some minis have a few more "accessories" than others; a few have larger memories, operate faster, and can handle more sophisticated tasks. But all minicomputers behave like their larger counterparts. Only the prices and data-handling capacities are "mini." Stripped-Down Computers. 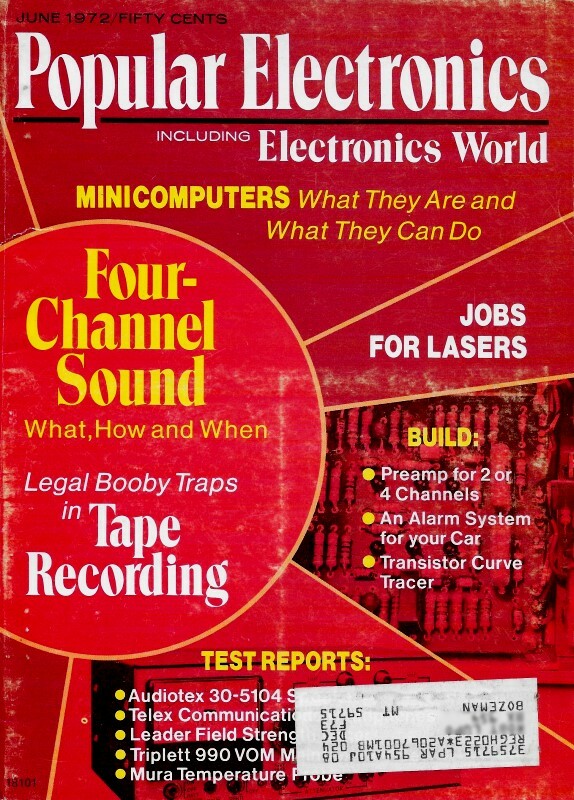 One of the first things minicomputer engineers strip away from big computer designs to make a mini is the number of bits that appear in each instruction or data word. Whereas the large computer typically handles up to 36 bits of information per word, minis generally take on between 8 and 16 bits per word. It is possible to parallel several minis or use some programming tricks to extend the word length, but for most minicomputer applications, 16-bit words are long enough. Another cut is in the size of the ferrite memory core. Large computers have storage space for millions of bits of digital information. Most minis come equipped with a memory capacity of 4000 16-bit words. The user can, however, buy extra 4000-word memory modules to expand storage capacity to 32,000 words. Minicomputers, such as this one from Xerox Data Systems, are used as aids in many different kinds of research. The third major cut in sophistication is in the mini's programming capability. Any computer's internal workings operate on a complicated sequence of ''1'' and "0" binary codes. It is possible, and sometimes necessary, to program a minicomputer by feeding it a program written in the awkward binary form. A set of switches and lights allows the user to "converse" with the mini in binary language. Since binary language is awkward for most people, manufacturers now include an assembly program in their minicomputers. This fixed program lets the user instruct the computer via standard typewriter symbols and words. The user still has to feed in one instruction for each tiny step the circuits must take, but the built-in assembly program makes custom programming a simpler and speedier process. Newer minicomputers take the programming one step further. Many models currently available have compiler language such as FORTRAN, ALGOL, and BASIC fixed into their memories. These sophisticated programs take a simple input command-such as "add" - and translate it into the dozens of separate binary commands the machine needs for carrying out the operation. Like the custom programs, built-in assembly and compiler programs take up valuable memory space and thus add to the cost and complexity of the minicomputer. The FORTRAN program, for example, takes up a full 4000-word memory module in most cases. If the user wants a 4000-word capacity for his custom program, he must outfit a mini with at least an 8000-word memory, 4000 to do the real work and another 4000 to make programming easier. Because memory space in a minicomputer is precious, users seldom try to store more than one custom program at a time. Whenever a program change is wanted, new instructions are fed in via punched cards, paper or magnetic tape, or a teletypewriter keyboard. This type of reprogramming can be troublesome and time consuming; so, most minis operate in a dedicated mode (one-program) application. Within the limits imposed by the small size of the memories and arithmetic units, a mini can perform just about any type of task a large general-purpose computer can handle. Although a mini might spend its entire lifetime performing only one of several different types of tasks, the user has a virtually unlimited number of tasks from which to choose. This minicomputer system from Varian Data Machines, like many others, is used in medical research/treatment. Considering its small size, rugged construction, and relatively low cost, a minicomputer is far more suitable for most on-the-spot data acquisition, control, and data processing operations than is any large computer. Gathering The Data. Many scientific and industrial processes require the gathering of large amounts of data from many different sensing devices over a very short period of time. 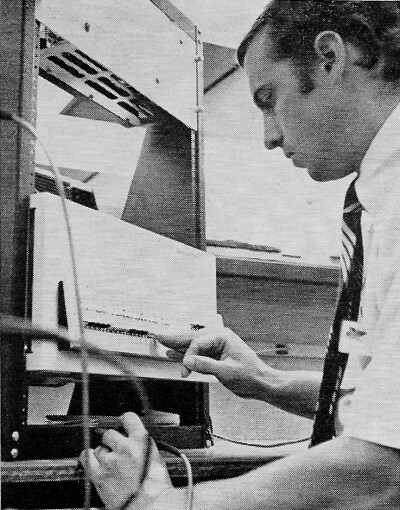 Using a minicomputer data acquisition system, data can be gathered from hundreds of sensors virtually instantaneously with the results printed out on a teletypewriter. A mini can take care of all the data manipulations as fast as the sensors can provide the information. It can calculate averages, smooth out random fluctuations, look for critical readings, and construct graphs and tables in less time than it takes a man to jot down a single set of readings. A single centrally located computer could take over the work of dozens of minis scattered around a large plant or lab facility, but the cost of a single large system is far greater than that of ten of the more expensive minis. Too, a user can buy minis a few at a time and spread out their cost as opposed to the large initial outlay for a single general-purpose computer. Most kinds of sensors (thermocouples, pressure sensors, strain gauges, etc.) generate analog Signals. A minicomputer, a digital device, employs input amplifiers to scale the analog voltages to the proper levels and analog-to-digital (AID) circuits to translate the analog signals into digital form. These input devices and the mini and peripheral equipment make up the building blocks for a complete minicomputer data acquisition system. Under the control of an acquisition program stored in the mini's memory, the system samples data from each sensor, assigns binary codes, and stores the data in another part of the memory. If the program calls for data manipulations, the computer pulls the appropriate data out of the memory and performs the assigned operations. Using a display program, the mini can print out the results on a piece of paper, display it on a CRT screen, or store it on punched cards or magnetic tape. Minicomputer data acquisition systems do more than just gather and print out data. They also manipulate the data, putting it into a form that is more useful to the human operator and other machines. Process Control Applications. The only real difference between using a mini for data acquisition and in control applications is that, in the latter, emphasis is on controlling other machines rather than gathering data from them. Minicomputers are so well suited for process control applications that they are beginning to take over from punched-tape machine controls. Digital Equipment Corp. minicomputer used in conjunction with controller of an automatic coil winding machine. Instead of taking instructions from a moving punched tape, the mini quickly calls up rapid sequences of control instructions from its memory. By means of a preset program, it can control motors and valves in machinery as simple as a punch-press or in systems as complex as NASA's Lunar Excursion Module. Just as most sensing devices produce analog signals, a goodly number of the devices a mini must control operate on analog voltages. This means that D/A converters and power amplifiers must be used between the mini and the devices it controls. Using a building-block approach, an engineer can assemble just about any kind of custom minicomputer control system he desires. Traditional Mini Roles. Minicomputers demonstrate their most unique capabilities in industrial data acquisition and process control applications where no other computing device has been able to meet, effectively and economically, so many different kinds of challenges. So, it is easy to overlook some of the more traditional jobs they can perform. In an engineering office, for example, a mini can carry out most design and analysis problems engineers encounter. With a small mini close at hand, there is no need to wait in line for time at a big computer, and there is no need to struggle with the schedules and peculiar operating characteristics of commercial computer time-sharing services. The minicomputer is available at all times; and, since most users buy their minis outright, there are no running-charges to deal with. These advantages apply to business offices as well. Office users of minicomputers include those who must process a lot of information daily but would have insufficient running time to justify the cost of a large computer system. In business data processing applications, minis can operate in conjunction with any of the traditional computer input and output devices, including punched card and magnetic tape equipment. Throughout most of the 23-year history of modern computer technology, engineers have placed emphasis upon developing faster computers which can handle more information with more efficiency. With the coming of large-scale integrated circuits (LSI's), this trend is reaching a new plateau. There will always be a demand for larger and more sophisticated computer systems, but there is a greater and more immediate need for computers at the minicomputer end of the scale.